What's behind door number 4? What cha reakon guys? A new zone or just some of the old levels upside down? The fourth world is another set of 10 levels (based on the general theme of ghosts & ghouls etc, as far as I can remember). 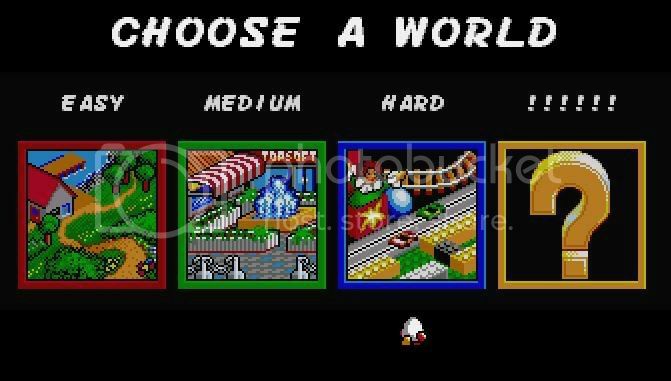 You can only access it by completing all 10 screens of the "hard" world. from what i can remember its far to fast, and you can't really see were your going an whats chasing you..lol it wasn't all that clear. Not as good as the original version. This version was also on Amiga and Atari ST, the levels are less faster on those versions. The first three screens were called "Dead Centre of Town", "Going Underground" and "Wizard's Tower". I've no idea about the other 7 because I never got that far. I got this far and died, I take it you need to complete that level to access it on the level select screen. Got further today, I forgot to take a screenie for level 2. it was a underground sewer sort of level. This the one you had trouble with AndyC? Here are the levels after it, the last image was where I got game over. IMO, this game is pretty much a matter of waiting or trying to reach a certain item to get rid of the monsters and finishing a level. Heres the music for this level. And the reason why I've posted all this, is because I find it rare for Dizzy fans to get this far on this version of Fast Food. Thanks for putting those up, Adz.M, I've always wondered what the last few levels looked like. I think the best thing is that you got so far with so many lives left (I remember being on one life for ages, and getting very annoyed at being killed on Wizard's Tower, as I was due for an extra life immediately afterwards). I wonder if the Food for Thought board was the inspiration for the Amazing Illusion screen on FWD? ^ I doubt it as FWD came before this version of Fast food.. chances our that was the inspiration of this room. Has anyone completed the original??? ?